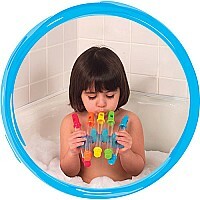 Alex Toys Rub a Dub Water Flutes help little ones discover musical notes and sounds while in the tub. 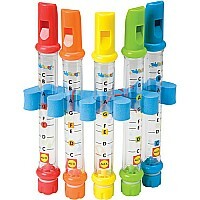 The five included flutes can be filled with different amounts of water to create different tones. Little ones can follow along with the instructions to learn simple songs. Tune the water flutes by dunking them underwater and filling until they reach the right level designated for each note. The squares and circles on each flute signify notes that can be followed with the included song sheets. To drain, just push the bottom cap up and twist. 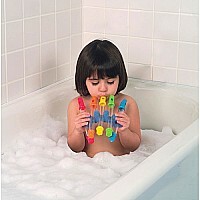 Hang the flutes in the holder and let them dry until the next musical bath performance. 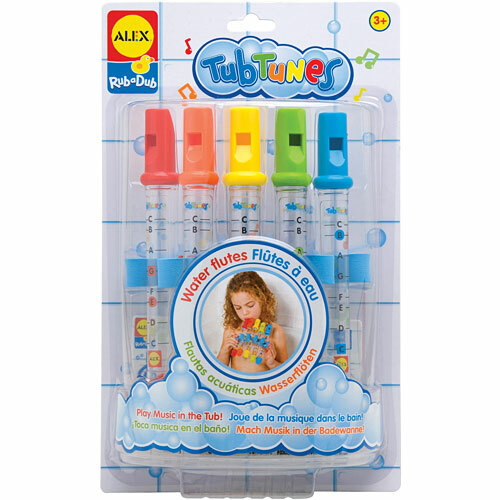 The Alex Toys Water Flutes come with waterproof song sheets that can be stuck to the bath or tub wall. Songs include "It's Raining It's Pouring," "Mary Had a Little Lamb," "Ode to Joy," "Old McDonald Had a Farm," and "The Itsy Bitsy Spider." All song instructions are great for children and easy to follow. 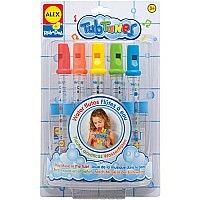 Includes 5 flutes, flute holder and waterproof song sheets. Recommended for children 3 years of age and older. Measures approximately: 7.50 x 3.00 x 12.25 inches..